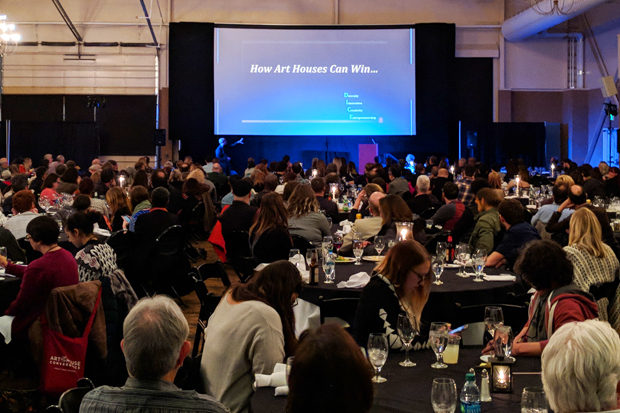 Last month, I had the honor of co-chairing the Art House Convergence, an annual conference for Art House theaters, which took place in Midway, Utah. The annual event is the largest gathering of art house cinema professionals and attracts participants from around the world. By defining the field, creating a shared vision and vocabulary, and identifying best practices, the educational components of the conference strengthen efforts to sustain art house cinemas of various sizes, operating structures, and programming philosophies. The goal is to engage art house theaters, film festivals, film societies, museums and other exhibition-oriented organizations through a variety of topics. The museum’s Doris Duke Theatre is a singular art house that holds its own. And as its director, it’s my goal to keep it mission-based, community-driven and, most important—relevant. Which is why you’ll see shifts in theater programs that are a result of community demand and the national conversation I was part of at Convergence. The Convergence began in 2006 when the Sundance Institute invited 14 art house theaters to the Sundance Film Festival. By 2008, the theaters decided to start their own annual winter meeting in Utah, coinciding with Sundance. Since then, the annual conference has grown to more than 600 attendees and now includes regional seminars, industry events, and other programs throughout the year. Along with co-chair Chris Collier, co-director of Philadelphia’s Renew Theaters, I oversaw the development and planning of the conference program. The experience was eye-opening and informed how we position the work we do at Doris Duke Theatre within a local, national, and international context. Here’s what I learned. How do we take action to actively dismantle oppression and inequity in our organizations and communities? How do we implement this work within our programming, marketing, operations, fundraising, and educational programs? Nation-wide, the art house world is primarily white, wealthy, and above the age of forty, so how do we better serve younger audiences, people of color, and lower-income patrons? In light of gender inequity and the fact that two major cinemas in the art house community—Cinefamily and Alamo Drafthouse—experienced high-profile sexual harassment scandals, how do we re-evaluate and shift our film culture to elevate women’s voices and prevent harassment of any kind? Throughout film history, art houses have determinedly and defiantly evolved in response to the times. But how do we continue to be nimble and adaptive in an ever-evolving industry that constantly questions the value and existence of the art house? With Netflix, Moviepass, and virtual reality challenging the traditional experience of cinema, what role does the theatrical experience have in today’s world? When facing pervasive issues of inequity, changing technologies, and competing business models, art houses’ ability to evolve is measured by 1) our ability to facilitate uncomfortable conversations about what we don’t do well and 2) our ability to organize and activate our collective resources. Conferences usually involve a lot of self-congratulating, but the reality is that we can all do better and need to talk about that. When so much of our time and energy is spent making ends meet in our local cinemas, devoting more time and energy to participate in a larger collective effort can be daunting. Art of conversation. The Convergence is described as a communication channel for art houses. After ten years of growth, the conference structure had to evolve to make space for increasingly diverse voices. Its expansion tended to compartmentalize certain conversations from the rest—while conference sessions focused on topics like concession stands, repertory programming, and digital marketing, participants where having their own concerned discussions on race and gender in hallways and other alternative spaces. 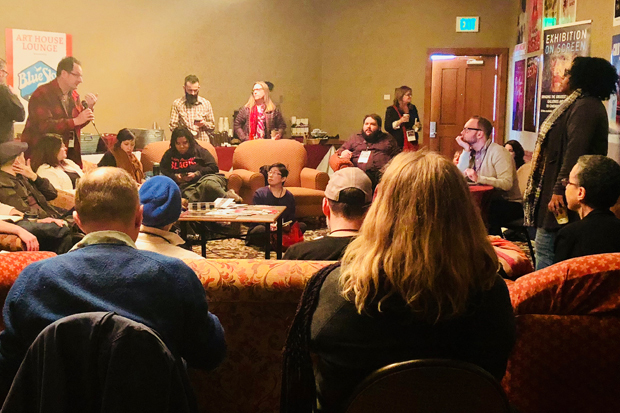 If communication channels make up the blood flow to a healthy community, then Convergence’s task was to reconcile those conversations, recognize the power dynamics within the conference, and re-envision an inclusive structure for better dialogue. So this year the conference took great steps in this direction—from re-structuring how the conference is organized to moving conversations that were once on the fringe into the spotlight. But there is still more work ahead. The hope is that, as the Convergence continues to evolve as a communication channel, understanding the intersectionality of the work we do will become easier. For example, we cannot address racial inequality in our programming without realizing how operations, development, education, and marketing influence that programming. The Convergence can inform how we re-conceptualize those disciplines. Beyond that, evolved communication channels help to visualize what collective action might look like in the face of industry-wide issues. The widespread action required for systemic change is hard to visualize, but my experience at the Art House Convergence taught me that, when we first focus on creating space for healthy conversation, new communication channels form that map direct pathways for collective action. Gina Duncan, associate vice president of cinema at the Brooklyn Academy of Music (BAM), leads an Alliance for Action breakout discussion about equity in art house operations. Collective action. 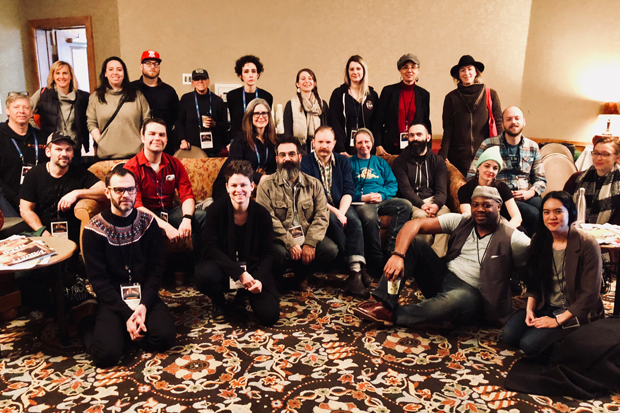 My involvement as co-chair of the Art House Convergence wouldn’t have happened without the Alliance for Action, a collective that I co-founded last year with Courtney Sheehan, the executive director of Seattle’s Northwest Film Forum. This working group of art house professionals is dedicated to addressing equity issues in independent film exhibition and distribution. We formed the group to create consistent space for conversations that were not happening elsewhere in the art house community. It started with fifty art house professionals in a lounge having frank conversations about topics like hiring more diverse staff, programming films that go against market trends, outreach to underrepresented communities, subversive promotional strategies, and re-envisioning memberships for lower-income patrons. This year, we expanded our conversational space by hosting seven sessions to address equity issues in programming, marketing, development, operations, and education. Keynote presentations focused on racial and gender equity, and a plenary conversation examined sexual harassment in cinemas. If it weren’t for the formation of Alliance for Action, our commitment to monthly video chats, and our ability to work with other conference organizers, we wouldn’t have been able to put equity issues at the center of this year’s conference. The Alliance for Action members strike a pose. Between tackling inequity and the rest of our industry problems, conference attendees took breaks to have fun at things like movie trivia (competing with the nation’s premier cinephiles is pretty scary), karaoke, and Trailer Wars—in which theaters submit their best in-house movie trailers. And then there’s the ever popular Art House Tales, a PechaKucha-like event that gives each theater three minutes to tell their story. 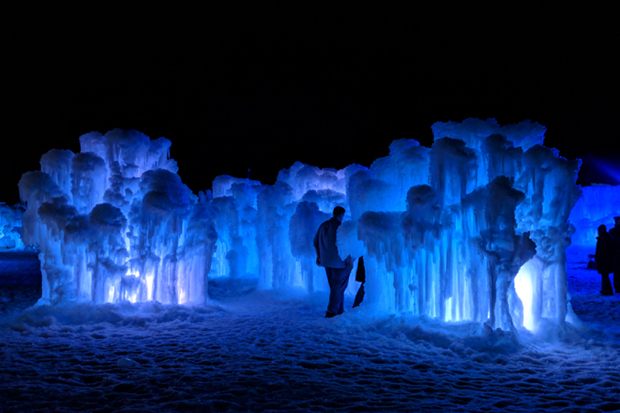 There’s also an ice castle (see below). After four intense days of conferencing, most of us head to the Sundance Film Festival to watch films and hang out in Park City. Mission-driven, community-based, and doggedly independent, art houses often work in silos from one another. We realize that the local scale of our operations has certain advantages in an Internet-driven world: it enables us to have deeper relationships, create in-person communal experiences, and maintain greater curatorial accountability with our audience, but as much as we work with a community-based mindset, we’re only beginning to realize the impact a national community of art houses can have on our collective audience base and the film industry as a whole. 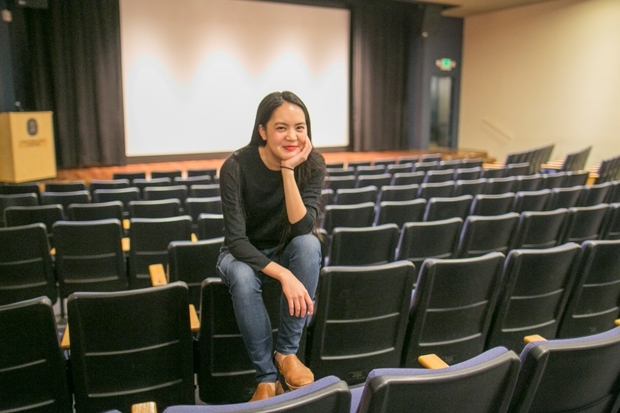 As a theater operating in Hawai’i, it’s easy for us to forget that we are part of a larger network, but the work we do on a local level has wider implications than we realize. At the Doris Duke Theatre, all our programs are in the process of evolving, and that evolution requires constant conversation with our audience, festival committees, volunteers, and staff. Like many art house theaters, we often facilitate difficult conversations, organize community, and creatively sustain ourselves against the odds. What I learned was that the skill sets we hone on a local level are the same skill sets applied within the larger industry community. While art houses are still in the process of evolving in response to equity concerns, new technology, and new business models, I look forward to continuing to participate in the ongoing conversations and collective actions that will help drive that evolution forward. Coast to coast: All the art house theaters in the U.S.
See the Indiewire story on this year’s Art House Convergence. Taylor: This is a great article and i congratulate you on your leadership. I found it especially interesting as HOT faces the same issue – an audience primarily white, wealthy, and above the age of sixty! Other Hawaii organizations, especially in the arts face this as well. I for one would love to see a wider convergence of the affected organizations in our community. And I love your wide ranging film program. Anita Hill was gripping and so relevant! Bravo Taylour, and your staff, you are doing amazingly on bringing on this evolution! Very pleased you have started the “conversations” in the various forms, be it through the movies screened, meet the artist Q & A sessions, or just open dialogue in the cafe area. I was quite impressed by the indie films picked last year on Syria, Yemen etc., to the most recent not really full blown “Bollywood” series on women’s issue, skin color issue, class issue etc., all delivered powerful messages which made us think and talk. This triggers conversations among friends, fellow viewers, community, which starts the rippling effect of raising awareness, piquing the interest to learn more, and removing ignorance. Ignorance separates people, groups instead of evolving us into global citizens and stewards of this world. Possible to bring schools, classes, educators into these viewing and conversations, or vice versa? Keep up with you and your staff’s great work and mission!